7, the official website upgrade: new node and desktop wallet download method. 3. 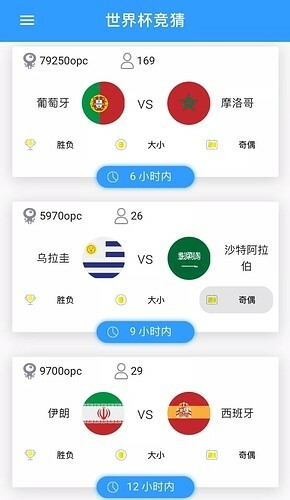 The octopaul Dapp is officially launched and iteratively improved, and the registration of the coin transfer activities, users can use the octopaul DAPP to predict the World Cup. Up to now, the total number of participants in the octopaul World Cup quiz has been 2,212 person-times, and the total amount of participation in the forecast is 692,453 OPC. The highest level of participation was in Germany vs Mexico, with 119,759 OPC and 279 participants in the competition. The octopaul has been put into use, and please look forward to other DAPP development.